R6: Game/10: Akobian Vs So : 0-1. First, the U.S. Game/10 Championship held on June 6th, an 8-round Open ’10-minutes time control with 2 sec. time delay’ Swiss System Tournament, a FIDE Blitz Rated, where GM Wesley So (6Wins-2Draws-NoLoss) tied for 1st Place with GM Varuzhan Akobian (7Wins-1Loss) both scoring 7.0/8 points. 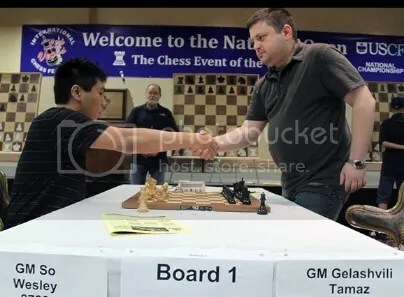 Enrico “Ikong” Sevillano a U.S. based Filipino (Cebuano) Grandmaster came in solo in 3rd place with his last round(R8) against GM Wesley So ended in a draw. GM Sevillano scored 6.5/8 (6Wins-1Draw-1Loss). 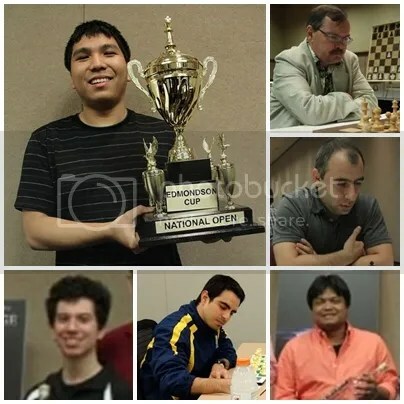 National Open winners: Wesley So, Ehlvest, Akobian, Ramirez, Hoyos and Sevillano. Second, the National Open Championship, a 6-round ‘Standard’ (3-day) or alternate 2-day Swiss System Tournament, one of U.S.A. longest running premier Open tournaments since 1965 when it was established by Ed Edmondson, the centerpiece of the Las Vegas International Chess Festival held on 7-9 June 2013, produced a 6-way tie for 1st among the 6-GMs namely Wesley So(PHI)2705, Jaan Ehlvest(USA)2621, Varuzhan Akobian(USA)2609, Alejandro Ramirez(USA)2574, Manuel Leon Hoyos(MEX)2568 and Enrico Sevillano.(USA)2467. 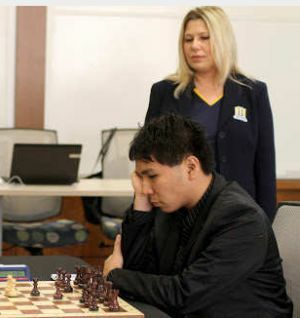 GM Wesley So, a freshman from Webster University (2013 U.S. College Chess ‘Final Four’ National Champion) coached by GM Susan Polgar was declared the 2013 Edmondson Cup winner by submitting the best tie-breaks points. 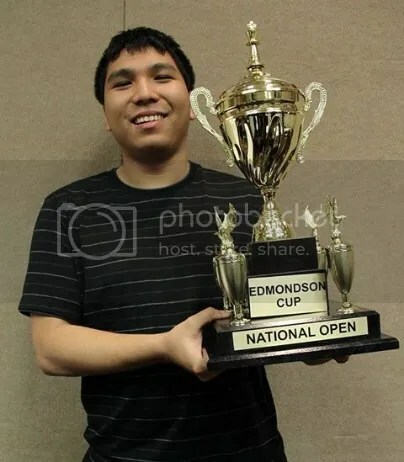 En route to his 1st Edmondson Cup, Wesley So, registered for the 2-day playing schedule where R1 to R3 scheduled on June 8th were played in ‘non-standard’ or shortened time control thus it was not FIDE rated. He scored 2.5/3 with a single draw in R2 against GM Giorgi Margvelashvili (GEO)2555. R1 & R3 were won games. R4, the start of the ‘Standard’ time control games (for the 2-Day schedule), that was also played on June 8th, Wesley So won against GM Mikheil Kekelidze(GEO)2503. R5: National Open : So Vs Gelashvili : 1-0. R5 was a crucial game against R4 solo leader sporting a perfect score of 4.0/4. GM Tamaz Gelashvili(GEO)2560 succumbed to time pressure and resigned on the 47th. With the win in the penultimate round GM Wesley So arranged the final round meeting with his co-leader GM Alejandro Ramirez (USA)2574 who also had a big win in R5. Sensing the 2013 Edmondson Cup already in the bag with only one player, his Webster U teammate, GM Manuel Leon Hoyos had an outside chance to overhaul his lead if Hoyos defeats another Webster U teammate GM Ray Robson, he quickly settled for a 12-mover draw with GM Ramirez. Hoyos pressing for a win against Robson could not extract the full point and the game ended in a draw after white’s 45th move. GM Wesley So final score was 5.0/6 (4Wins-2Draws-NoLoss). His R4 to R6 results had gained +3.7 points to his ‘standard’ FIDE Live Rating that now stands at 2708.1. Additionally, he now has a streak of 54 games ‘No-Loss’ record in official FIDE rated ‘Standard’ Chess events. Third, after resting for a few hours (this could be one reason for a quick draw in the final round of the National Open), GM Wesley So returned to the National Open Blitz Championship at 9:30pm on June 9, a 7-round Double Swiss (14 games: playing white & black Vs each opponent) with Game/5 minutes (no delay) time control, and annexed his 3rd Crown at the 2013 Las Vegas International Chess Festival, scoring 12.0/14 from his 10 Wins, 4 Draws & No-Loss record a full point ahead to the 2nd placer GM Aleksandr Lenderman. I’d say Wesley is at par with Karjakin, Caruana, and Anish Giri who defeated him before when he was not in the US. 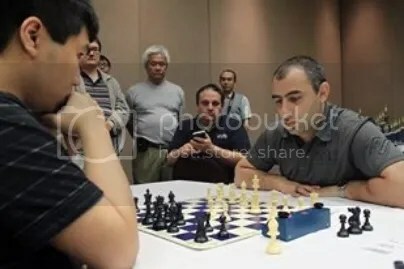 Watchout coz Wesley So is focused on them 3. Check this link. Wesley So defeated Fabiano Caruana when he (Wesley) was 11 years old. Caruana was 12 then. Had he been given the same opportunity that Caruana and Giri had in terms of financial support, he could have been in the top 10 of the chess ratings earlier on. The next stage, looking to the future, is how strong Wesley So is, in relation to the other players of his sort of age. Among the players of Carlsen’s age and younger, we have, according to the live chess ratings, the following, today’s ratings. 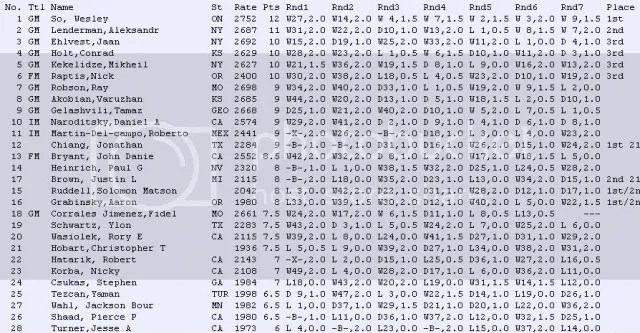 The source is Live Chess Ratings 2700, an admirably concise summary of what, statistically, is going on at the top level of international chess. The final figure shows the change of rating in games played this month. There is a massive gap between Carlsen and the three youngest grandmasters given here, but given a year or two, Caruana, Giri and So are capable of closing much of the gap. The point here is that in the current tournament being played at Havana, it has now been demonstrably clear that So is at the level of chess strength with Giri. These four players would seem to be the players who are likely to dominate in say three or four years time. And then we will be starting to think about who the youngest players will have serious prospects of aiming for the top.